Tangkula Wall Cabinet Double Doors Wood Hanging Bathroom Kitchen Cottage Collection Wall Mounted Storage Cabinet Medicine Organizer could add the ultimate storage unit to your room. This space saver cabinet features a modern-contemporary design with white finish. The wall mounting design provides extra storage while saving plenty of space. 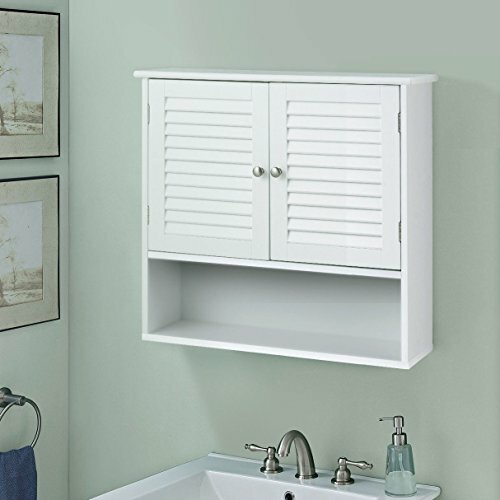 This furniture is ideal for storing towels, toiletries, and other necessities. After you buy it, it would make your bathroom or kitchen more organized, you could classify different types of things in different tiers, and also you could give them various tags to divide the part you want to put. Please recheck the size of item and the size you want to put it in, we hope this item could bring you happiness not trouble. Thank you for your attention to this item, if you keep on look it, why not try to buy it? Don't hesitate to buy it!  SUIT FOR SMALL PLACE: The wall cabinet can be assembled on wall or over the toilet and space-saving, providing extra storage without taking up valuable floor space, so that this is a perfect storage solution for homes. Its design maximizes the space of your room, which enables you to make your place clear.  WATER-RESISTANT DESIGN: This bathroom wall cabinet is used a painted process that is waterproof and moisture resistant. That is super suitable for humid environments, such as bathrooms or toilets. It has features of louvered door for air circulation, water-resistant and damp-proof.  FIT TO MULTI-DECOR: This simplified white wood wall cabinet really is an excellent choice for present concise beauty decor. Some group would also prefer European Style, and we do believe this cabinet can also suitable for it, which can be a bright feature around it. Likewise, America Pastor and Nordic Minimalist Style fit.  DURABLE AND STURDY: This wall cabinet is made of high grade solid MDF material, with silver metal handle knobs make it easy to open and close. Comes with pure white finish, this storage cabinet is stable, durable, non-toxic and looks elegant. It is enough to meet your daily needs.